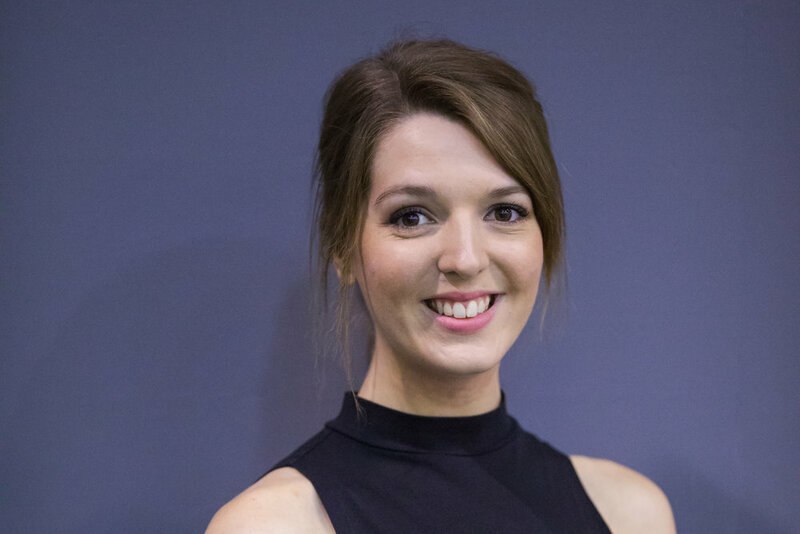 Joanna is a soprano who graduated from the Royal Welsh College of Music and Drama with an MMus with Merit in 2017, where she studied with Kate Woolveridge and David Doidge. She now studies with Yvette Bonner and will perform in the chorus of Donizetti’s Anna Bolena with Longborough Festival Opera and as Ella in Forbear! Theatre’s production of Patience in summer 2019. Professional highlights of 2018 included playing Phyllis in Forbear! Theatre’s Iolanthe at the International Gilbert & Sullivan Festival in Harrogate; performing a second season in the chorus of the National Gilbert & Sullivan Opera Company; and as soprano soloist in a Remembrance concert of Charpentier and Bruckner with the Broadstone Choir in Dorset. Opportunities at RWCMD included playing Amore (Monteverdi's Il ritorno d'Ulisse in patria) in Opera Scenes 2017, Mrs Page (Vaughan Williams’ Sir John in Love) in Opera Scenes 2016 and soprano solos in Bach’s Weihnachtsoratorium conducted by Peter Hanke (Chamber Choir) and Britten’s A Ceremony of Carols (Lunchtime Lights) in 2015. Joanna also performed in the choruses of the college productions of Le Nozze di Figaro and Falstaff in 2016, and as Red Guard I and pianist in Welsh National Youth Opera's critically acclaimed production of Kommilitonen! by Peter Maxwell Davies. Joanna is a regular soloist with the Wandering Minstrels, who perform concerts of G&S, at the Bromsgrove Festival in Worcestershire, and in various concerts in and around Peterborough and Bishop’s Stortford. Coming from a musical family, Joanna was introduced to Gilbert and Sullivan when she watched her first show at the age of 5, and has since taken part in countless productions with Forbear! Theatre, International G&S Festival (Harrogate), Peterborough G&S Players and University of Birmingham G&S Society. A highlight of 2018 was playing the Princess of Monte Carlo (as well as various chorus roles in a cast of 8 altogether) in Forbear! Theatre’s very well-received production of The Grand Duke. In summer 2017 she debuted in the chorus of the National G&S Opera Company, also playing Peep Bo in The Mikado, and returned to the company the following year. She also played Kate in The Pirates of Penzance in concert with Welsh Musical Theatre Orchestra in 2016. Other favourite roles include Rose Maybud (Ruddigore), Mabel (The Pirates of Penzance), Tessa (The Gondoliers), Katisha (The Mikado), Patience (Patience) and Buttercup (HMS Pinafore). Joanna graduated with a BMus (Hons) from the University of Birmingham in 2014, studying voice with Catherine Benson for 3 years there. During her undergraduate degree she sang in several choirs, vocal ensembles and a cappella groups including solos with Birmingham University Singers and University Women’s Choir (runners-up in the Choir of the World final, Llangollen 2014). She also played Carlotta in the musical theatre group's acclaimed production of The Phantom of the Opera, Eurydice in Orpheus in the Underworld, and understudied Countess Almaviva in The Marriage of Figaro. Joanna has loved performing on stage since she was very young. Her first taste of stage performance was in pantomime choruses from the age of 9, and shortly after that she began taking part in musical theatre summer schools, playing such roles as Nessarose (Wicked), Amber (Hairspray), Adelaide (Guys and Dolls), Calamity Jane and Oliver (Oliver!). Joanna also had dance lessons and took part in dance shows for 15 years, specialising in freestyle but also studying ballroom, Latin, tap and ballet. You can watch recordings of Joanna by going to Video. She frequently sings at weddings, funerals and other events. To get in touch, go to the Contact page.